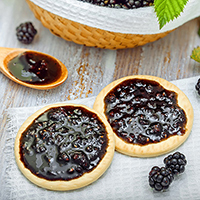 Blackberry jam sandwiched between crispy-chewy cookies. Mix together butter and sugars until creamed. Add eggs and vanilla; mix well. Slowly mix in the flour mixture, then stir in the oats. Using a tablespoon of dough per cookie, roll into balls. Place balls of cookie dough on aluminum foil or parchment paper-lined cookie sheets and bake at 375°F for 6 minutes. Rearrange the cookie sheets in the oven so that the cookies from the bottom rack are on top and vice versa. Bake for another 5 to 8 minutes, until lightly browned and firm. Cool cookies on cookie sheets then peel off aluminum foil or parchment paper. Spread a thin layer of jam on the bottom of one cookie and top with another. Repeat until all cookies are used.